Let me confirm for those of you who have an overactive imagination like I do, this sweepstakes is for the chance to win a real life-size Chevy Camaro. Something about the Hot Wheels Edition part just wouldn’t let my brain rest until I saw that the value was $45,000. That’s either a real Camaro or the world’s most expensive toy car! Plus you get $15,000 cash, which I assume is in part to cover the taxes. In actuality the Hot Wheels Edition is a customization of the Camaro that Chevy introduced to celebrate 50 years of die-cast dream cars. This special edition includes an exclusive Crush exterior color and Jet Black leather interior with orange inserts and stitching, 20-inch Satin Graphite machine-faced wheels, a unique grill, orange brake calipers, a 50th Anniversary fender badge and more. Pretty cool custom details that make this Camaro truly one-of-a-kind. If you win you actually get your choice of the three awesome prizes. The Camaro and the cash, or an L.A. vacation packed with exciting events like tickets to an NBA game, a shopping spree, and a Porsche driving experience, or a year’s worth of Oil Changes, a gift card and an Xbox game. Personally, even though I’m not partial to muscle cars, I would choose the Chevy Camaro. You could always sell it, create your own vacation, buy some oil changes, and still have some dough left over. Or just keep it as an heirloom because, you know, custom Chevy Camaro! I sincerely wish one of my subscribers or fans will win this amazing prize. If you are the winner, you’ll have to send Granny a picture of yourself in your “hot” new ride. Just note that I’m not responsible for any speeding tickets you might get in this head turner! Let me know in the comments below if you played with Hot Wheels when you were a kid and what your favorite American muscle car is. OMG! I once had a boyfriend who owned a ’69 Chevy Camaro and I fell in love with that car. To this day, my all time favorite car is the Camaro. What I would do to own one. Maybe (and hopefully) my wish will come true and I’ll win this one. love the camaro. my dream car!! 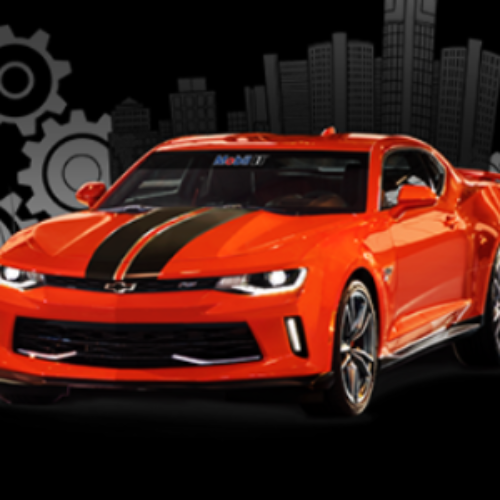 I would absolutely love to Win a Custom Chevy Camaro + $15,000 Cash. I play with hot wheels now with my grandsons. My favorite hot rod with a 1969 Chevy Super Sport that I owned. Being without a car is very difficult. I hope and pray I win this! I would love to win! I played with hot wheels as a kid. And my favorite car is a camaro. Why do the links to the contest never work? At least I don’t have to worry about winning anything.